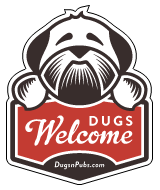 Any business which displays our Dugs Welcome sticker is happy to have dogs onto their premises and will go out their way for dogs. We are therefore grateful to every business that displays our sticker as we see it as a privilege to be able to take your dug with you to a pub, shop or cafe. That’s also the reason we give our Dugs Welcome stickers away for free! As well as adding new listings, we always make an effort to regularly review all our listings to ensure the information is up to date. However, due to the number of businesses that we list there may be changes we are not aware of. Business ownership can also change which may mean that the dog friendly policy of the business also changes. Although there is no law which prevents dogs entering pubs, shops or cafes (as long as they cannot access the kitchen and food storage areas), it is the business owners individual choice as to what their policy is and therefore this must be respected. If you find out about restrictions which are not noted by us or that the business no longer accepts dogs, just let us know and we will update or remove the listing. Please don’t be offended if you are asked politely to leave or have been denied entry to a pub, cafe or shop. There may be a number of reasons for this – just let us know. We have listed below some things to keep in mind when visiting one of the “Dugs Welcome” businesses to ensure that we can all enjoy this privilege for a long time. Let’s think of it as “Dug Etiquette”. These apply when visiting any business that allows dogs in however and not just the ones displaying the Dugs Welcome sticker. Every business is different. Please keep in mind that some pubs, cafes and shops are small and therefore it may not be practical to have more than one dog on the premises at the same time where on the other hand a large pub may not mind. Some pubs may also only allow dogs into specific areas or at specific times. If the pub or cafe is very busy (or even “stowed”) then it may not be the best time to visit with your dog – go for a walk and try again later. Exercise / take your dog for a long walk beforehand and ensure that your dog has done all the necessaries. Take a water bottle, travel dog bowl and some treats with you in case the pub or cafe doesn’t have any. Although nice to be offered water and treats for your dog, best to never assume that it’s guaranteed, so always be prepared. Don’t take your dog into a pub, cafe or shop if he has just been on the beach or is wet (i.e. been swimming in the local pond/river or sea). If possible keep your dog close to your feet or under a table. Don’t allow your dog to roam free around the pub or cafe. Keep your dog on a lead and make sure you know what he/she is up to at all times. Please don’t allow your dog to go on the furniture (chairs, benches and especially the tables). Some dog owners like to put their dog on their lap however not every establishment will allow it so check first. The odd woof now and again is fine but if your dog is barking excessively, is likely to, or is growling at people, then just head home and try again another time. If there is another dog already in then sometimes it’s best to sit at the opposite end of the pub or cafe. However, if this has got your dogs interest then you may have to walk over and introduce them. Obviously if they aren’t getting along then best to head off and come back another time (or go somewhere else). To avoid injury to your dog (or anyone else) make sure your dog isn’t blocking a walkway or in a place where people may trip up (or stand on its tail). As we all know after a few pints judgement and spatial awareness goes out the window. Especially make sure that staff can get past and get on with their job.